EVE Evolved: What went wrong with the Shadow of the Serpent event? Last week’s EVE Online patch added the massive Shadow of the Serpent event, a game-wide storyline arc that pits players against the Serpentis and Angel Cartel pirate factions. 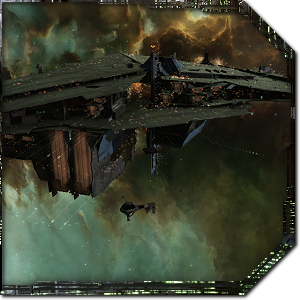 The pirate factions of EVE are engaged in a dangerous arms race as each attempts to design and build its own custom capital ships, and player capsuleers are caught in the middle of it. A new in-game service from The Scope news corporation shows players a variety of different challenges associated with the event, from destroying Angel and Serpentis outposts and looting Angel shipyards to clearing NPC guards from stargates or even just mining ore inside a pirate site. As with previous PvE events such as the Crimson Harvest and Operation Frostline, event sites are spawning all throughout the game and appear on everyone’s overview. Rather than the sites themselves dropping rare loot, the challenges awards points and three special reward containers are unlocked once you hit the 10,000, 25,000, and 50,000 point marks. The idea was to have a game-wide inclusive event that would encourage players to co-operate to complete sites, and in that sense it has been a success. Unfortunately, the event has been hampered by a lack of direct rewards, and its long grind has been condemned by players. In this edition of EVE Evolved, I look at what went wrong with the Shadow of the Serpent event, how CCP can avoid the same fate for future events, and what can be learned from Guild Wars 2‘s similar approach to group PvE. 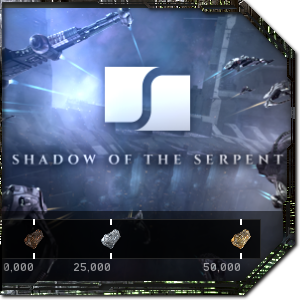 The basic idea behind the Shadow of the Serpent event is actually pretty solid: By uncoupling the main rewards from loot drops and granting all players who take part in an event site full completion credit, CCP ensures players should naturally co-operate. The previous events saw intense competition over site completions, with many players destroying the final boss NPC under another player’s nose or just stealing the loot. Granting all players who help in the site full reward credit flips this dynamic on its head, turning other players from competition into convenient help. When completing event sites, I definitely found myself welcoming and helping other players a lot more than in previous events, and ad-hoc groups of players did frequently form. Reward scaling isn’t a new idea, and it has worked in countless other MMOs to encourage co-operation in group content. Guild Wars 2 uses it as one of its core gameplay features, giving all players involved in an event rewards based on participation level (a copper, silver, or gold ranking) and even giving each player who deals enough damage to an NPC his own set of loot. While EVE would never scale NPC bounties or loot in this manner, Shadow of the Serpent has showed that giving event completion credit to everyone who takes part works. The problem is that completing a site often doesn’t feel rewarding by itself unless it’s the final one in an active challenge, and if a particular type of site isn’t part of your current challenge list, then it’s worthless. With the Crimson Harvest and Operation Frostline events, at least each completion involved guaranteed loot drops with a chance of getting something rare. The main difference between the Shadow of the Serpent event and previous PvE events is the introduction of a new reward scheme sponsored by news corporation The Scope. Players earn event points by completing challenges such as taking down five or ten of a particular Serpentis event sites or even just mining some ore, and there are big reward crates available at 10,000, 25,000, and 50,000 points. It wasn’t long after the patch when EVE players did the math on the event (because if there’s one thing we love, it’s doing the math) and discovered that the event is a colossal grind. Reaching 50,000 points to get all of the rewards takes around 500 event site completions and is estimated at over 40 hours of solid grinding. Scoring points toward rewards is another idea that has actually worked extremely well in Guild Wars 2, which has similar reward tracks for PvP and World vs World gameplay. Each PvP match grants players points on the reward track, which feels like a free bonus rather than a grind and gives a sense of progress with each match even if you didn’t win. The main difference with EVE’s Shadow of the Serpent reward track is just the frequency of prizes: EVE’s event has only three prizes separated by mountains of grinding, while Guild Wars 2‘s reward tracks have frequent small prizes leading to one big prize at the end. The small rewards in GW2 are enough to dampen the grind and give a sense of progress even when you only have 30 minutes or so to play. Players complained that the Shadow of the Serpent had very little direct loot, and CCP responded quickly by giving the battlecruiser NPCs some named items, but the real problem is the lack of immediate rewards and feedback from site completion. In the previous game-wide PvE events, all you had to do was find a site in your overview and shoot a few NPCs to immediately get a small drop of themed loot and a chance of getting something rare. You could take part even if you only had 30 minutes or so to play, or could do a quick site if you had some down time during PvP. Getting anything of value out of Shadow of the Serpent requires a considerable time commitment, and you have to find specific sites and enemies based on your currently active challenges. The simplest improvement to the current system would be to add direct rewards to all sites and then make the challenges an extra bonus. The main reward should be points toward your reward track based on your participation level in the site, with additional site loot being a bonus. The reward track should contain small bonus packs every 1,000 points so that you occasionally get smaller rewards leading up to the big one, and the big reward cache needs to have a lot more value. 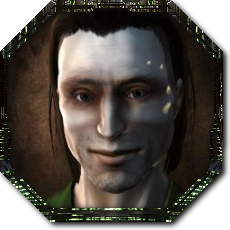 The small reward packs could contain one copper, silver or gold cerebral accelerator plus some random loot, and the large ones could contain Serpentis modified capital components, the new Asklepian implants, and even Shadow Serpentis loot. When I spoke with CCP Affinity and CCP Bergur at EVE Fanfest 2016, they were genuinely excited for the Serpentis event and the direction that PvE is taking in EVE. They made the case that PvE is composed of more than just shooting at NPCs and that events like this should encompass other areas of gameplay such as mining and manufacturing. This seems to have influenced the active challenges in the event, some which include mining 50,000 units of veldspar, completing exploration complexes, or doing incursions. Players are given four active challenges at random, and the only way to get new ones is to either complete an existing one or wait for three days for it to expire. If the intent was to open this event up to new types of gameplay and people with different play styles, then it’s actually done the exact opposite of what it was intended to. The only way to score points in the event is to complete challenges, so all this does is arbitrarily limit how you can participate in the event. Right now I’m legitimately mining ore in a Deimos to get rid of a challenge to mine 50,000 Veldspar, and the systems near me are filled with sites whose completion won’t help me progress. The easiest solution would be to make all challenges available at all times, but this could be an opportunity to add a daily login incentive. 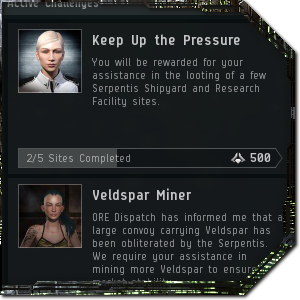 If CCP adds point rewards for completing all sites as I suggested above, then the challenges become optional extra bonuses and players could instead be limited to four randomly selected challenges per day. Rather than require players to log in frequently by making a huge grind, the system would then encourage daily logins to complete your optional four small boosts or at least to see if there are any that are easy to complete. Despite all of the criticisms presented in this article, I’m actually having a lot of fun with the Shadow of the Serpent event and finding the tiny bit of direction it provides oddly encouraging. While most forms of PvE are typically something you do on your own or with existing friends, these event sites are attracting diverse crowds to form ad hoc groups. CCP is taking on board all of the feedback from the Shadow of the Serpent event at the moment, so hopefully future PvE events will be able to avoid some of the same pitfalls. Ultimately, this style of PvE with collaborative events popping up all over EVE feels more like what an MMO should be about. I’m reminded of my days spent in the static complexes of the Gallente COSMOS constellation where strangers would routinely help each other complete the dangerous missions, or of the first few weeks of the Incursion expansion when players who had never met began grouping up together and discussing strategies. 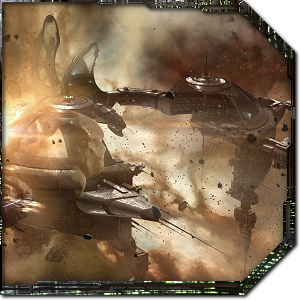 EVE Online is best known for its hyper-competitive gameplay, but events such as this show that it has an enormous capacity for co-operation if the gameplay just encourages it a little.